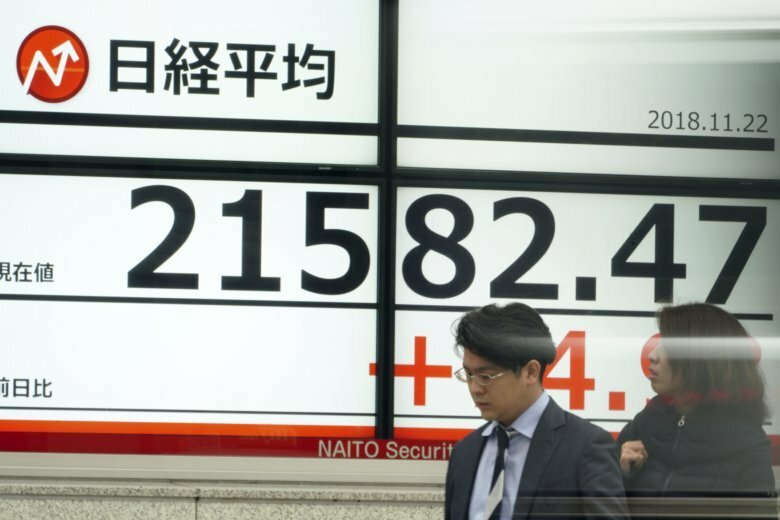 SINGAPORE (AP) — Asian markets were mostly lower on Friday as traders dwelled on risks from a drawn out dispute between the U.S. and China. Wall Street was closed Thursday for Thanksgiving. KEEPING SCORE: South Korea’s Kospi shed 0.7 percent to 2,055.30. Hong Kong’s Hang Seng index dropped 0.7 percent to 25,845.78 and the Shanghai Composite gave up 1.4 percent to 2,608.32. Australia’s S&P/ASX 200 bucked the trend, adding 0.4 percent to 5,713.90. Shares fell in Taiwan and Singapore but rose in Indonesia. Japanese markets are closed for a holiday. U.S-CHINA TRADE: U.S. President Donald Trump and his Chinese counterpart Xi Jinping will meet at the Group of 20 summit in Argentina next week. The leaders are hoping to unwind a spiraling dispute over Beijing’s technology policy and trade practices. The countries have placed additional tariffs on billions of dollars of each other’s goods, which has fueled worries over softening global growth. NISSAN FIRING: Japanese automaker Nissan Motor Co. has fired Carlos Ghosn as its chairman, after he was arrested for alleged financial improprieties. The powerful executive has been credited for Nissan’s revival from near bankruptcy. He will continue to remain chairman of French carmaker Renault, whose shares plunged after Ghosn’s arrest and have yet to fully recover. Renault owns 43 percent of Nissan, and Nissan owns 15 percent of Renault. Ghosn is also chairman of Mitsubishi Motors Corp, which will hold a board meeting next week in reaction. ANALYST’S TAKE: “With U.S. markets away for Thanksgiving and there lacking fresh leads, the risk-off tone looks to continue dominating into the end of the week,” Jingyi Pan of IG said in a market commentary. ENERGY: Benchmark U.S. crude lost 75 cents to $53.88 per barrel in electronic trading on the New York Mercantile Exchange. The contract gained $1.20 to close at $54.63 in New York on Wednesday. Brent crude, the international standard, lost 2 cents to $62.58. It lost 88 cents to $62.60 in London. CURRENCIES: The dollar was flat at 112.95 yen. The euro strengthened to $1.1410 from $1.1403. The pound extended its gains to $1.2880 from $1.2879, on news that Britain and the European Union had reached a deal in principle on future relations.